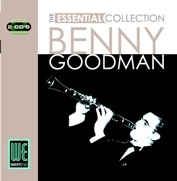 Swing comes to the Essential Collection with the addition of Benny Goodman to our ever expanding series. Our re-mastered double CD takes up the Goodman story in 1933 and follows him through the critical year of 1935 when he made the monumental decision to play a selection of Fletcher Henderson tunes to a restless crowd at the Palomar Ballroom. Taking the tunes at breakneck speed the set was compelling and unrestrained, the King Of Swing had been born! We say goodbye to Goodman in 1952 with appropriately a song entitled Goodbye, by which time he had disbanded the big bands and began to form smaller groups and bands for specific projects. By then his reputation was secure as the tracks on this CD will testify.